I highlighted Part 1 of my Nightmares on Cardboard entry here. 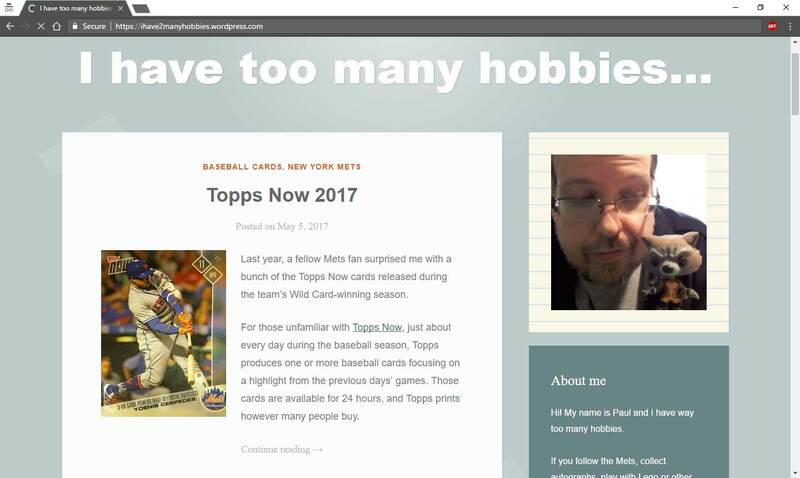 If you like my cards please vote for me to win Thorzul's contest by going to his blog and voting on the right side of the page. 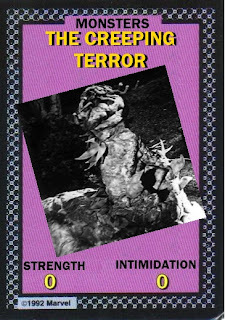 Along with my set of American Movie cards I also created five cards for some of the words/lamest movie monsters in history. 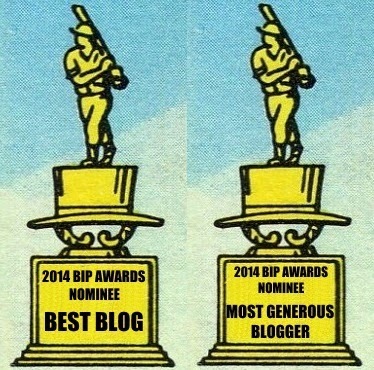 Nearly all of these I was originally introduced to them through episodes of Mystery Science Theater or Rifftrax. 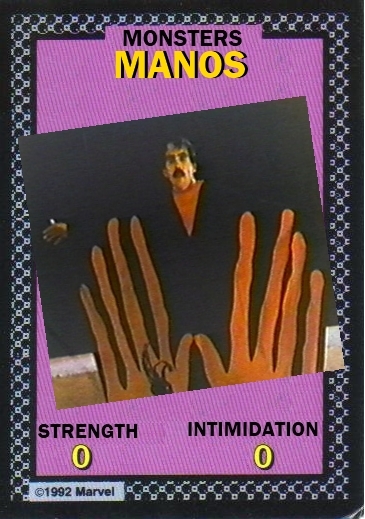 We begin with The Master from Manos: The Hands of Fate. In one scene from The Creeping Terror as the monster eats a woman, the victim is clearly climbing into the monster's mouth. It's simply one of the worst constructed monsters in cinema history. I will forever be a M. Night fan no matter how many poorly made films he puts out. He made three of my favorites, Unbreakable, The Village, and the Sixth Sense and so I'll give everything he does a try to see if it is a return to form. If you haven't seen The Happening I would suggest getting the Rifftrax riff when you do because it will add a lot more enjoyment to the experience. 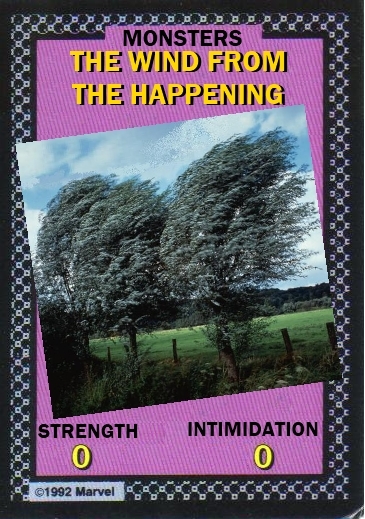 It's a mystery at first what is causing people to kill themselves and so for most of the film the main characters are running away from gusts of wind. 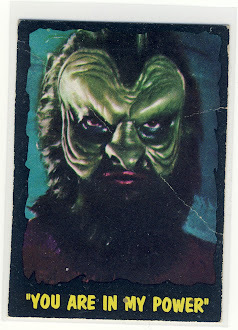 In the course of Plan 9 From Outer Space the aliens resurrect the recently deceased and so we get zombie Thor Johnson and although Thor was a former wrestler he has a lot of trouble crawling out of grave. 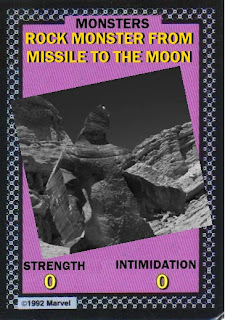 Missile To The Moon is a relative new one to me until Rifftrax featured it. Basically a couple of escaped convicts take refuge in a scientist's missile that just so happens to be headed to the moon. They end up running into these Rock Monsters which are clearly men in cardboard boxes that have been painted. 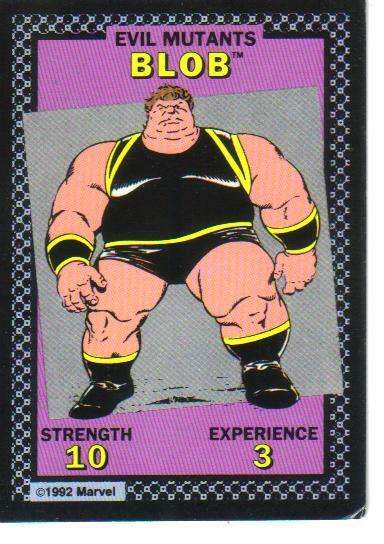 The inspiration for these cards was a Marvel X-men board game from 1992. I can't find the exact game online but it is similar to this one. 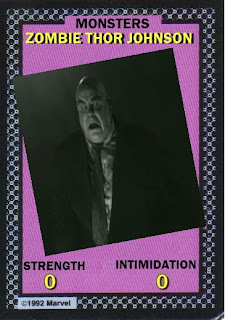 Each mutant was given their own "Strength" and "Experience" scores and the one card that I had on hand that I scanned was for The Blob. I modified "Experience" to "Intimidation"